**This giveaway is now closed. ** Congratulations to Krissa ([email protected]…), Savesum ([email protected]…), Miranda ( [email protected]…), Karin ([email protected]…) and JGuzman ( [email protected]…) — you each won a free bottle of Omega Orange to try! When it comes to healthy eating, I tend to be just as hesitant about natural and healthy alternatives as I am about things like processed food and high fructose corn syrup. I’m not one to trust that just because Dr. X says this or that supplement is good for you, it really is. So when Genesis Today contacted me to be part of their Genesis Today Superfood Ambassadors program, the first thing I did was send emails to more than 10 people I trust to ask their opinions. Not all of them were familiar with the company, but more than one replied that they love the Genesis Today products and the company itself, which was a relief. I accepted the offer to join the crew and waited anxiously for my Omega Orange juice to arrive because the buzz was quickly growing that this was some yummy stuff. Omega Orange is not just another orange juice. It has added DHA omega-3 fatty acids for heart, brain and joint health as well as added vitamins and minerals to fight free radicals and enhance your overall health. And it really is yummy, like an orangesicle in a cup! Genesis Today is committed to creating quality products from known superfruits grown in sustainable, fair trade environments. They offer a broad range of juices, supplements, puddings and teas made from superfruits such as acai, cacao, goji, resveratrol and kiwi formulated by expert nutritionists. 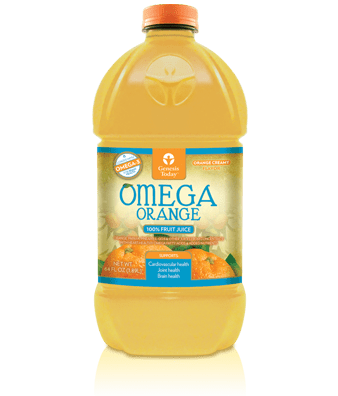 This week, five lucky Life Your Way reader will each win a bottle of Omega Orange from Genesis Today, shipped right to your door in a cold pack! To enter, leave me a comment and tell me about your favorite healthy food! This giveaway ends at 3pm EST on Saturday, 12/11. The winner will be selected randomly and notified by email, and this post will be updated with their name as well! One Life Your Way reader will also win PRIZE DESCRIPTION. This giveaway ends at TIME/DATE. The winner will be selected randomly and notified by email, and this post will be updated with their name as well!